Submitted photo With support from the Air Force Small Business Innovation Research/Small Business Technology Transfer Program, GATR Technologies developed a portable antenna with tracking capability. WRIGHT-PATTERSON AIR FORCE BASE – The Department of Defense now has access to a portable antenna with tracking capability that can be deployed in places where these capabilities are traditionally limited. Tracking antennas are used to communicate with satellites in non-geostationary orbits, as well as with other moving objects such as aircraft. However, legacy systems require a rigid dish with heavy-duty structural support making them difficult to use in many situations. With more recent support from the Air Force SBIR/STTR Commercialization Readiness Program and AFRL, the concept was refined to create the 2.4 meter GATR TRAC. It features mechanical and electrical components in a ruggedized base with support arms that allow the antenna to track satellites moving across the sky. To develop an inflatable tracking antenna, the company had to overcome the challenge of grasping a large flexible ball-shaped radome and pointing it accurately under varying weather conditions. The design evolution included improving reliability, creating a simple user interface, and upgrading assembly and disassembly procedures. 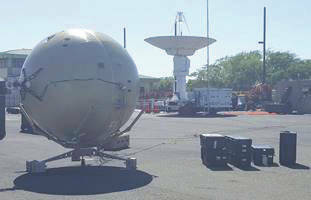 GATR TRAC has been demonstrated to reliably track satellites in low Earth orbit and produce usable imagery as part of a deployable ground station. It also has the ability to track satellites in other types of orbits. The company has already logged more than $2.2 million in sales of the new tracking antenna to the military, as well as a commercial customer that supports the Department of Defense. With hundreds of projected CubeSats in low Earth orbit that will require tracking antennas, GATR TRAC is also well positioned for a potential boom in demand. GATR’s recent successes – from its acquisition by Cubic to sales of its latest portable tracking antenna – are a critical benchmark for participants in the Air Force SBIR/STTR Program. This type of commercialization helps to bring down costs and get technology to the warfighter while spurring the economy through small business growth. https://www.fairborndailyherald.com/wp-content/uploads/sites/50/2018/02/web1_sateliteAFRL.jpgSubmitted photo With support from the Air Force Small Business Innovation Research/Small Business Technology Transfer Program, GATR Technologies developed a portable antenna with tracking capability.